OUR PRICE: $59.50 - Join Rewards Get $5 Dance Dollars On This Item! 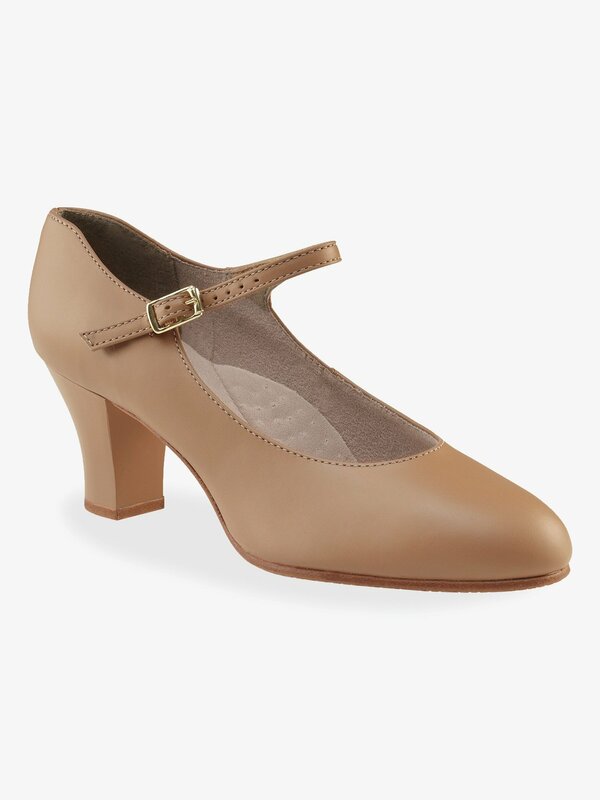 Capezio's "Student Footlight" features a 2" heel with a leather lift, scored leather sole with top grain leather upper, a stitched on strap with buckle suede sock lining and heel counter, and an arch cushion. Excellent character or tap shoe. Taps not included. Please see fitting chart. My daughter is a street 6.5 but likes them in a . I'd say the 6.5 would be just a bit tight. They're a very good deal for the money. Leather, beautiful and durable. They sweat the same as the cheaper ones, but they last longer in better shape . This is the 2nd pair (other pair in tan) and she loves them. These shoes are great for in class and on stage, they're not the easiest to point your feet in though. They're great but comfort wise tights make a huge difference! good sturdy shoe, with a true to street size fit. I ordered two pairs for two dancers, and both fit to street size shoe of 8.5 and 6.5. The heel is a little higher than i would have liked for young dancers. Using the shoe for folkloric dance. Shoes fit just right. I bought half size larger than my street shoes, as suggested. Wore them for an evening of ballroom dancing and had no problems. I ordered wide shoes and the ones that came were labeled wide but too narrow. I have been buying dance shoes for five years and have run into this inconsistency again and again. it is very frustrating not to know whether to up or down size from street shoe or if wide is actually going to be a true wide or not. These shoes are not a true wide. I tend to get bad calluses. I am not a professional dancer, but I wanted dressy comfortable shoes to wear out because I have a variety of foot problems, so it occurred to me to look up dancing shoes, and that was a great idea. I like the way the shoes make my feet look, slender, nice shape. They are comfortable, and the shade of tan, I love it! I am going to order same style in black, I know they will look and feel great! I would just add more padding at the balls of the shoe. I tend to get bad calluses. These are by far the most comfortable character shoes I've ever owned, even though these are only my 4th model. Unfortunately, I'm disappointed in Capezio with this model. I've owned my 650's for two months, dancing about 20 hours per week, and the bottom of the right shoe has separated itself from the top. I perform in my high school's show choir and the school musical so the dancing is difficult, but not too strenuous. Maybe I got a dud with this pair, but overall I'm disappointed with Capezio. I absolutely love these shoes. They fit my feet great and are so comfortable to wear. The only thing I suggest is when nailing in taps, make sure the nail does not go into the toe area or you toes will get scraped raw. But other than that they are great. I have had the Jr. footlight for two years now and thought it was time to upgrade. I love the different widths that you can choose from, because to be honest, I have really wide feet and the wide width fits perfectly. The only thing I can complain about is the plastic heel. It doesn't have the same look to it as the full leather heel, but overall, it's a great character shoe. These shoes are great. They needed barely any time to break in. The first day I wore them for class they were comfortable and no blisters anywhere. The lightly cushioned sole is very comfortable. The only complaint I would have for my shoes is that they are narrow on my feet, however that is my mistake and should have ordered a wide width instead. I thought that the regular width would be fine, but that was misjudgement on my part. Overall, these are fabulous shoes and would not trade them in for any other! I love these shoes. It does take a little bit of time for them to wear in but once they do, they're great. I had a pair for about four years and wore them till they were falling apart. I have never had any trouble with the way they fit my feet. I've owned the Jr. Footlight for the past 4 years and hate it because it's STILL hard as a rock, but I just bought the Student Footlight. 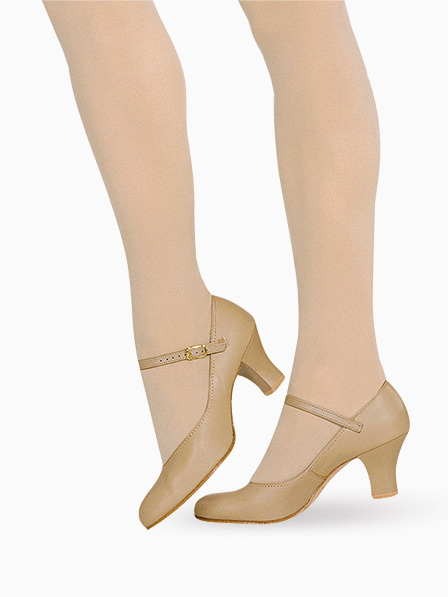 It's so much more comfortable because it is softer and the 2" heel elongates the leg more, so it is more flattering. how can I tell what size to order? Hello! Thank you for contacting us. We suggest that you order a half a size larger than the street size. What is a measurement guide for choosing a medium or wide shoe? I don't know if I need a wide shoe. Typically we base our widths off of your street shoe size. If you wear a wide in a street shoe, we suggest you find a dance shoe that also has a wide. Since you will be wearing and dancing in them for a longer period of time, we want you to be comfortable and have a good fit. If you wear a medium width regularly but notice a snug fit to your sneakers or dress shoes, you might want to try a wide in a character shoe as well.